PHUKET: -- The long-awaited second incinerator at the Phuket City Municipality facility in Saphan Hin failed to fire correctly during a trial burn this month, dousing the surrounding neighborhood in a foul stench. The disconcerting odor sparked a stream of complaints from local residents and from families visiting the popular recreational park nearby. “We had to move to solve the problem immediately,” said Tawatchai Thongmung, the Chief Administrative Officer (Palad) at Phuket City Municipality. Operations staff immediately shut the burner down, resulting in all trash intended to arrive at the new incinerator being redirected to the growing landfill located behind the facility. The cause of the misfire was attributed to an electrical fault. “Not only was there the bad smell, but there was also smoke,” said Darawan Naknakorn, 26, who exercises regularly at Saphan Hin Park. “Now things are better, but I still hope the people involved in solving the problem are able to do so quickly and prevent any further issues,” she told the Phuket Gazette. Mr Tawatchai explained that, at the time of the misfire, Phuket was caught in a low-pressure system, which brought heavy rains for over a week. The dense, low cloud cover at the time trapped the foul odor close to ground, exacerbating the problem for people in the area, he said. Pressure is building for the municipality to get the new burner online, Mr Tawatchai explained. “The old incinerator is no longer capable of running at full capacity and it has a problem with its ventilation system, so we cannot use it to dispose of all the trash,” he told the Gazette. “We currently dispose of 500 tons of trash a day by dumping it in the landfill. We have enough space in the landfill for the trash until the new incinerator is ready for operation, which I believe will be no later than the end of May,” he said. 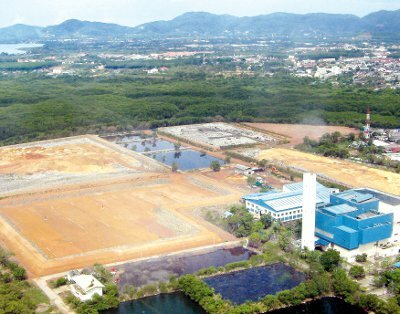 The new incinerator, when up and running, is expected to dispose of up to 700 tons of trash per day, allowing Phuket Municipality to burn off additional trash that is currently piling up in the landfill.